Office of ombudsman: Why the delay? The lofty idealism of our Constitution makers is manifested in Article 77 of the Constitution which provides for establishment of an institution of ombudsman. 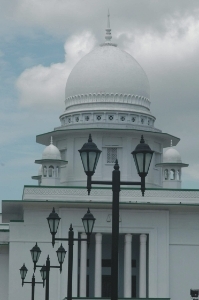 However, no initiative was made to introduce this institution until 1980 when late President Ziaur Rahman took initiative to establish the office of Ombudsman in Bangladesh and accordingly an Act was passed by the then parliament in 1980. Unfortunately no government made this law effective by establishing an office of ombudsman. But the office of ombudsman has been long overdue in view of widespread corruption and maladmi-nistration in Bangladesh. Ombudsman was created first in 1809 when Sweden adopted its new Constitution. Following the footsteps of Sweden the institution of ombudsman was adopted in other countries. The Swedish word 'Ombudsman' means a delegate, agent, spokesman, representative etc. So ombudsman means the man or official who represents the people in their grievances or who acts as a commissioner of parliament to redress the grievances of the people. He is also called a 'grievance man'. From the functioning of ombudsman's office established so far in various countries it may be said that it is an office created either by the constitution or law. This is a body independent of the executive and responsible only to parliament and the principal function of which is to investigate complaints of maladmi-nistration against various government departments or other public bodies. In every country the purpose of creating the office of ombudsman was to safeguard the rights of citizens from the administrative excess, to examine complaints of infringement of the people's rights. There, are, of course, some traditional methods whereby numerous organs of the government may be monitored and kept under control in the interest of the governed and various grievances of citizens can be redressed. These methods are mostly legislative and judicial. Among the legislative methods parliamentary questions, no-confidence motion, censure, cut motion, adjournment motion etc. are prominent. But due to strict party discipline these devices no longer bring the administration under strict control and the citizens' grievances can little be redressed. The legislature is 'more a forum for the ventilation of grievances than for securing their redress.' Again, the members of parliament have little time to attend to all the grievances of their constituents. With the enormous growth of governmental authority the volumes of request for such assistance has placed an impossible burden on individual members. Hence something more is needed to meet current needs and the answer has been found in creation of the office of ombudsman. Again, the technological development and the growing complexity of governmental functions and responsibilities are forcing the state to leave a wide discretion to the bureaucracy. With this wide discretion has increased administrative abuse of powers affecting the lives and rights of ordinary people in varying degrees. Also the bureaucrats are not directly accountable to parliament. Complaints can, therefore, always be heard that public authorities, although they have acted within the law, have failed to observe the proper standard of administrative conduct and these are the situations where neither court nor any tribunal can offer remedy. Moreover, experience shows that normal judicial system is not effective in preventing such abuse of power. Also judicial remedies are mostly time-consuming and expensive. These considerations and factors led the development of a system of ombudsman enabling proper investigation of the citizens' complaints against abuse of power by administrative officials and redress made easier and quicker. There are now over a hundred local and national ombudsmen around the world. This covers almost 80 countries who maintain various categories of ombudsmen with or without parliamentary ombudsman. Such an overwhelming adoption of the institution proves its success. iii) The ombudsman may, on the basis of a newspaper comment or otherwise, proceed suo moto. Of these, of course, the individual complaints are the main source of cases brought to the Ombuds-man's attention. Any individual feeling aggrieved by any administrative action or inaction may file a complaint to the ombudsman. It is not necessary for the complainant to employ legal advice. What he needs is to make the complaint in writing and whenever possible, with appropriate evidences and relevant documents supporting the complaint. Once the complaint has been received in the office of the ombudsman, the case proceeds largely by correspondence. The ombudsman forwards the complaint to the official concerned and asks for an explanation; the officer returns its version of the matter together with any relevant documents. The ombudsman, if satisfied, informs the complainant of the official explanation. If he is not satisfied, or if the complainant produces further evidences or challenges the official version, the ombudsman continues his investigation until either the complaint is found to be justified or the complaint is eventually dismissed as unjustified. It may be mentioned here that during the investigation, the ombudsman shall have access to all files and minutes of courts and agencies even to those normally privileged or secret; he may ask the department concerned to produce and submit such information as may be necessary for the ombudsman to decide upon the complaint or information. Besides this, the Swedish ombudsman undertakes periodic tours of inspection in the provinces or central offices, normally giving only a day's notice of his intention. These inspections are at random and they may concentrate on the financial affairs of the office concerned. Normally the ombudsman or his deputy carries out about four or five tours of inspection a year, each tour lasting a week or so. Ombudsman is appointed by the legislature; he is fully independent of the executive; he has the power to interfere in any sphere of administration. If gross maladministration is found, he can make order to rectify and the experience in countries which have introduced this institution, shows that his orders are promptly complied with. If, however, in any case, his order is not complied with, he may make report to parliament and debate may take place in the House; also the media can publicise it. Ultimately the administration will have to rectify it.... Cont. The concluding part of the story will publish on January 14, 2005. The author is Advocate, the Supreme court of Bangladesh.